Hung Pham, center, watches as daughter Elyzabeth Luu, left, and granddaughter Tasha Zentil look through a family photo album at a family get-together in Fountain Valley. The book included pictures of the Phams’ time at Camp Pendleton when they first arrived in the United States in 1975. Lan Zentil has 40 years of questions. Hung Pham, her father, has offered 40 years of silence. “There are so many things I don’t know,” she said. So father and daughter – and several other family members – recently hopped a plane halfway around the world, to Vietnam. It’d been nearly 40 years since the Phams, like thousands of others, fled a crumbling Saigon – 40 years since they climbed on a boat and sailed into an uncertain future. Theirs is a typical American story of immigration and assimilation. But it is also uniquely Vietnamese: After they escaped, the country the Phams knew essentially disappeared. For much of Lan Zentil’s immediate family – husband, Tony, and their children, Hendrix and Tasha – the trip to Vietnam would be a chance to experience something exotic, a newer, more vivid twist on the Little Saigon culture they’ve come to know. For Zentil’s mother, Tam Pham, who has been back to Vietnam without her children, the trip would be another emotional homecoming. But for Zentil and her father, it would be a search for the past – a chance to finally share their family story. They left in late March. A week later, they were in Vietnam’s bustling capital, Hanoi. Though Hung Pham is 77 and battles health problems, partially caused by Agent Orange, he was a storm of energy in Vietnam. It was Hung who, cane in hand, led his family past government buildings and apartment complexes, to places he wanted them to see. In the 1980s, at Zentil’s mostly white middle school in Bellflower, mean-spirited students made fun of a girl who had come recently from Cambodia. Zentil was one of those students. “I was whitewashed,” Zentil said. “I thought she was different. Zentil, now 40, tells this story over tea and egg whites at Zinc Café in Laguna Beach, where she lives. Her smile is optimistic, befitting her job as a real estate agent. Her speech lacks any hint of an accent. “Growing up, my father always fought to make sure I spoke English without one,” she said. “He told me that is the only way I would fit in and be successful. But until high school, she knew few other Asians. And during family outings to Little Saigon, she felt like an outsider. She knew little of her own history. Her father didn’t want to talk about Vietnam – about being forced to escape, about life as a refugee. He didn’t want to talk about how, in gaining an American dream, he lost his Vietnamese one. It wasn’t until years later, when Zentil went to UC Berkeley, that she began uncovering her roots. She studied psychology and French, but she also boned up on Vietnamese. She read about Vietnam’s 20-year civil war between northern communist and southern republican forces. She attended commemorations for the fall of Saigon. “I realized that I’m Vietnamese, too, not just American,” she said. Today, five minutes after arriving at Zentil’s Laguna Beach home, one thing is clear: She leads a distinctly American life. Her son, 9-year-old Hendrix, just back from soccer practice, plays on an iPad. Zentil and her high-school-sweetheart husband, Tony, chat about 11-year-old Tasha’s modeling career. Dessert will include Rice Krispies treats with salted caramel ice cream. Still, Zentil takes steps to foster her family’s heritage. She takes the kids on frequent trips to Little Saigon, for pho and shopping. Zentil goes to their school each year and talks to their mostly white classmates about Lunar New Year, teaching the traditional dragon and lion dances. But if her kids ask about life in Vietnam, or how their family came to America, she has few answers. Her father gave her few to share. 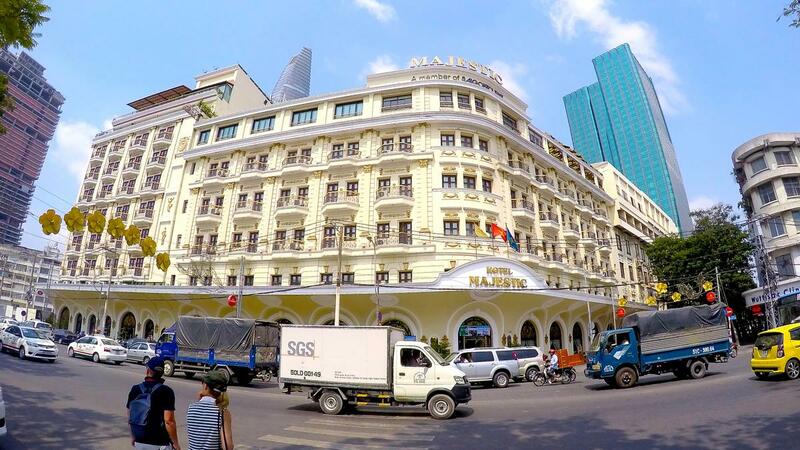 Hotel Majestic in Ho Chi Minh City, Vietnam in April 2015. This hotel is where Hung Pham abandoned his scooter, then walked across the street to leave Vietnam on April 29, 1975. It was past midnight on April 30, 1975. The weather was clear. Tam Pham was 26 and scared as she stood next to a lamppost near the Majestic Hotel on the Saigon River. She held her infant daughter, Lan, in her arms. She carried some food and a few bottles of milk. Her other children, Gem and Ly, stood nearby. Saigon was hours from falling. Death or forced labor loomed. And Tam Pham’s husband, Hung, had gone to find his brother. A small military boat was set to come and take the family out of the country. She watched the dock. So she waited for Hung to fulfill his promise to return. Later that day, Tam Pham and her children were on a boat sailing to the Philippines and, hopefully, after that, to America. The radio announced the communists had barreled through the presidential palace. South Vietnam was no more, existing only on the boats sailing under the yellow, red-striped flag. A few days later, an American carrier met their vessel on the open ocean. They said the boat could not sail into Philippine waters flying the South Vietnamese flag. The exhausted refugees held an impromptu ceremony and lowered the banner. People wept. “That’s when it sunk in,” said Tam Pham, now 66. 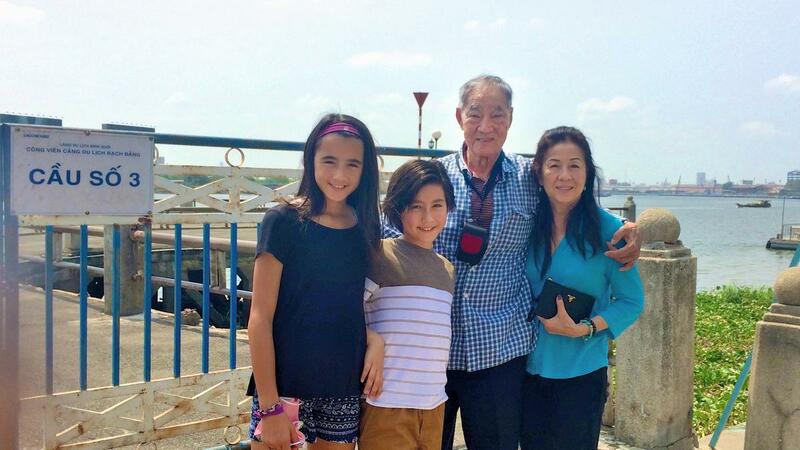 Hung and Tam Pham, right, with their grandchildren, Tasha Zentil, left, and Hendrix Zentil in Ho Chi Minh City, Vietnam in April 2015. This is dock number 3, the spot where the Phams left Vietnam on April 29, 1975. It was about noon on March 30 this year, when Lan Zentil and her clan landed at the Tan Son Nhat International Airport in Ho Chi Minh City. The weather was hot and humid. The shuttle to their hotel, a Sheraton, took them through a hectic metropolis – between skyscrapers and street markets, along scooter-cluttered roads and past hidden, unsanitary alleys. But the city once known as Saigon was (and is) ready for a ball. Plastic flowers and banners draped across entire buildings; a towering sign screaming a simple number – “40” – rose over a park. At the hotel, the Zentils put their bags in their rooms, only to be hustled back outside by Hung and Tam Pham. Ignoring the din of scooters and the thick smog, Hung Pham ushered them down the street to the Saigon River, to the Majestic Hotel. To the exact spot where Hung Pham kept his promise and got on the boat with his family – to where their Vietnamese life ended and their American one began. “It was emotional,” Hung Pham said of that moment. 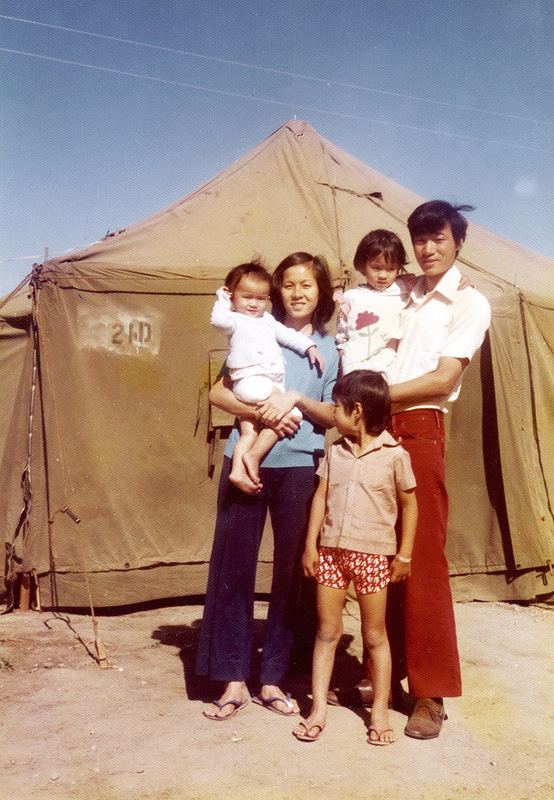 Tam Pham and Hung Pham in 1975 with their children, Lan, left, Elyzabeth, right and Gem, standing, at Camp Pendalton. The Pham’s came to the United States with their young children in 1975 after the fall of Saigon. 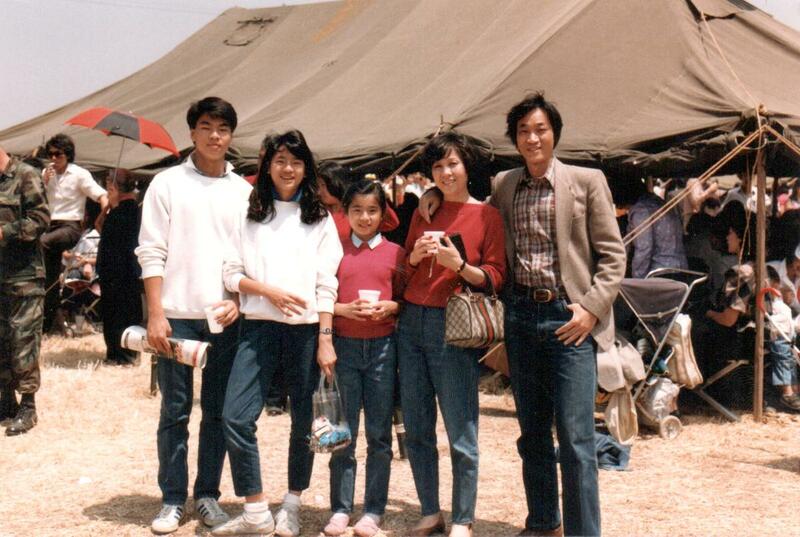 Two months after Saigon fell, the Phams and their children made it to the tents at Camp Pendleton. It wasn’t a home; it was a place for people without one. Pendleton was cold at night and dusty. The food, initially, was Western. Uncertainty defined their lives: Where would they live? What would they do for money? In late summer, the Phams moved to their sponsor’s home in Bellflower. Hung and Tam got jobs, eventually building careers as a banker and an English-as-a-second-language teacher for Vietnamese children. They moved into their own apartment. They sponsored other family members who wanted to follow them out of Vietnam. Their children, meanwhile, attended school, the incubator of American culture. They resisted. They absorbed. They grew. 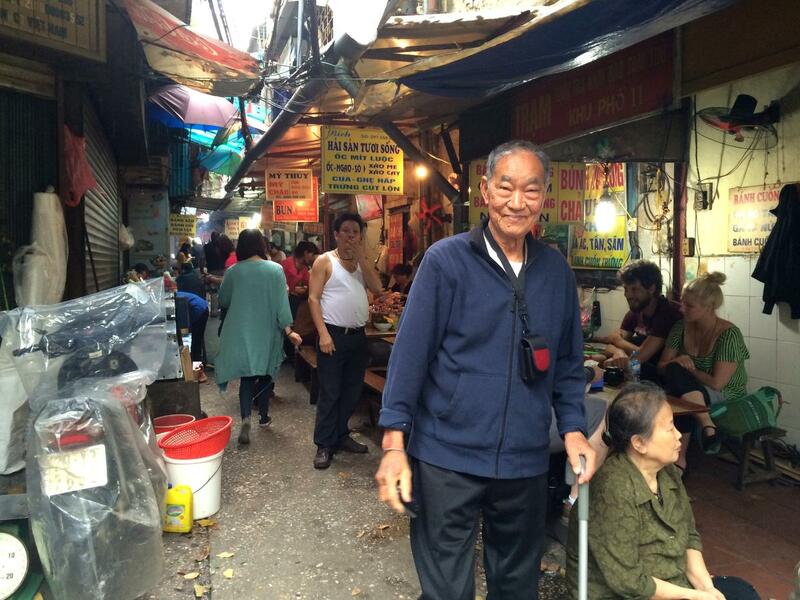 Hung Pham in an alley in the neighborhood where he grew up in Hanoi, Vietnam in April 2015. In Hanoi, this month, Hung Pham knew more about the city than many of the cabbies. He was born and raised in Hanoi, surrounded by parents and grandparents, aunts and uncles. That changed in 1954, when the French left their colony and communist forces swept into the north. Hung Pham, still a teenager, had to flee south to Saigon. He was beanpole thin then, with sharp, handsome features and fine black hair. Today, he faces the rigors of age. Still, earlier this month, as he walked the streets of Hanoi, he seemed younger. He’d meet friends at all hours, sometimes strolling into the hotel in the morning just as his daughter was walking out. But on April 7, that first day in Hanoi, the eyes of the family were on Hung Pham as he stretched his arm and pointed his finger. For the first time in 61 years, Hung was at his family’s historical estate. “This is my house!” Hung Pham said, his voice rising. Extended Pham family during a family get-together in Fountain Valley. came to the United States with their young children in 1975 after the fall of Saigon. 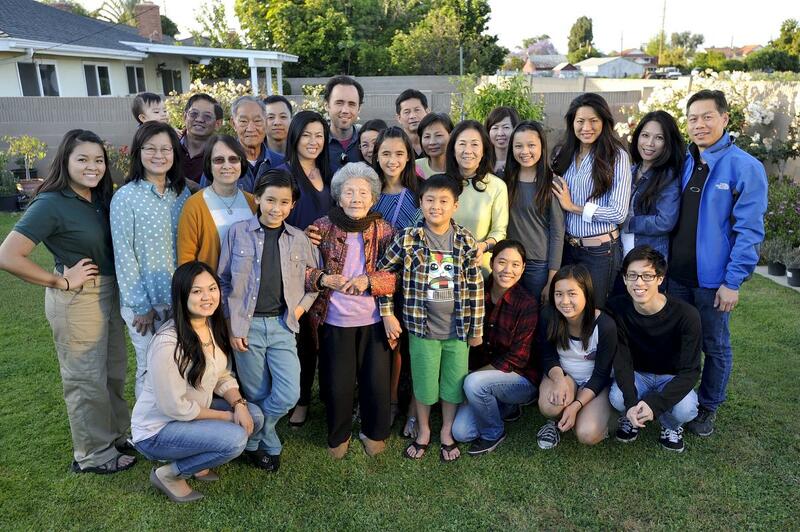 On April 11, a day after flying back from Vietnam, Zentil and her family gathered in Fountain Valley for a weekly rite: dinner at the home of Lan’s aunt. Traditional Vietnamese foods, including spring rolls and rice with fish sauce, covered a kitchen island, along with Mountain Dew and Dr. Pepper. Around the house, four generations of Phams chatted about their homeland. Hendrix watched television and played with teenage cousins. Tasha and her mother showed off clothes they brought back from Vietnam. Outside, aunts and uncles, including Hung’s brother – the one he found that long-ago night in Saigon – barbecued. Hung Pham, sitting at the dining table, still didn’t talk much about Vietnam or coming to America. But now he doesn’t have to; he’s shown them. 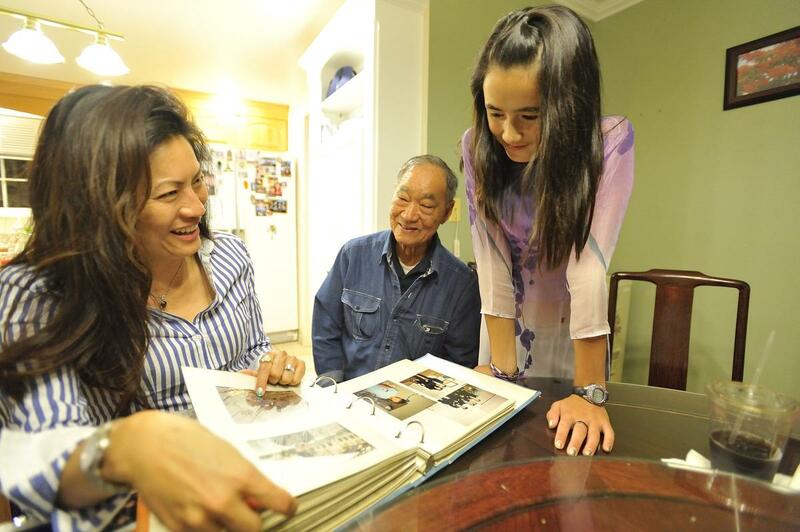 Later, Tam Pham stood near the family’s great grandmother, Chinh Le, as they watched a video of the recent family vacation. “It was a great trip,” Tam Pham said. 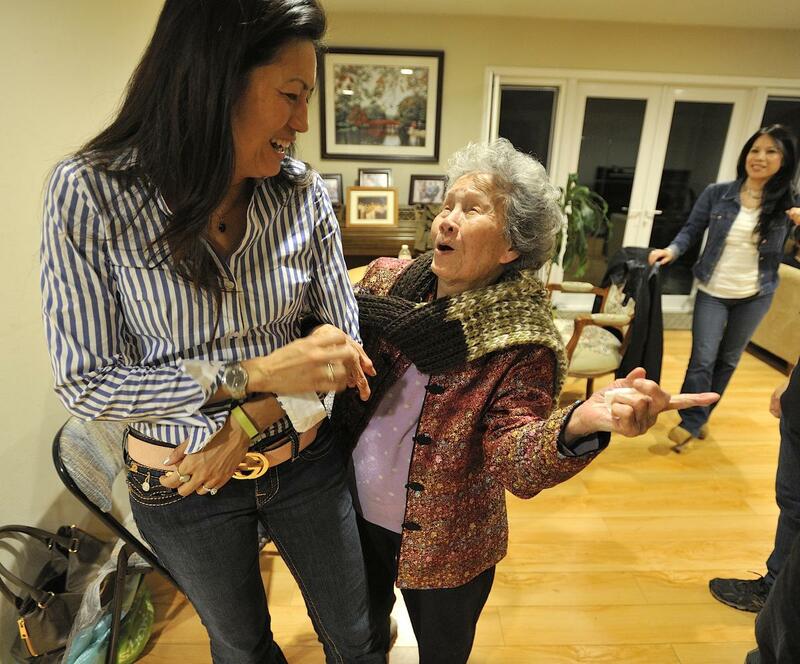 Elyzabeth Luu shares a laugh with her grandmother, Chinh Le, during a family gathering in Fountain Valley. 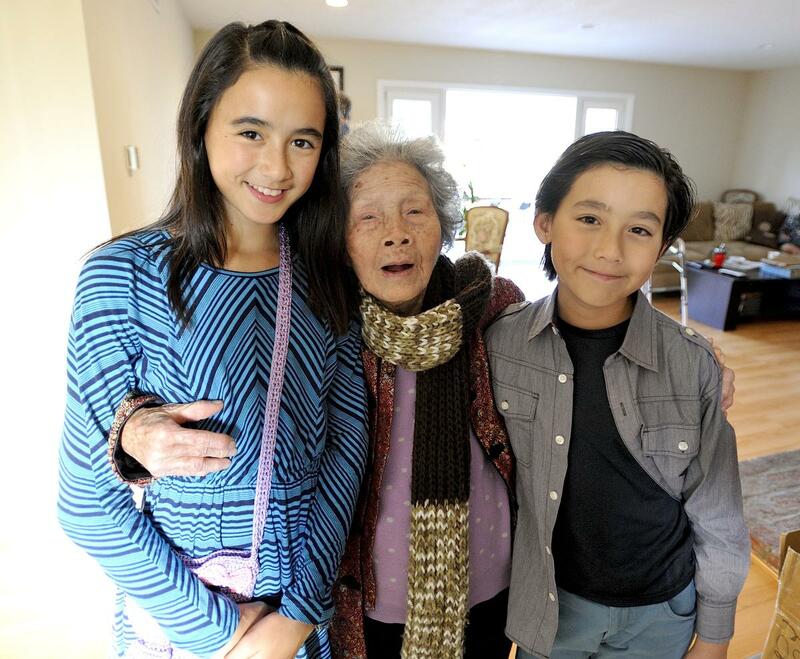 Siblings, Tasha, left, and Hendrix Zentil with their great-grandmother, Chinh Le, during a family get-together in Fountain Valley. Luu is Tammy and Hung Pham’s middle child. 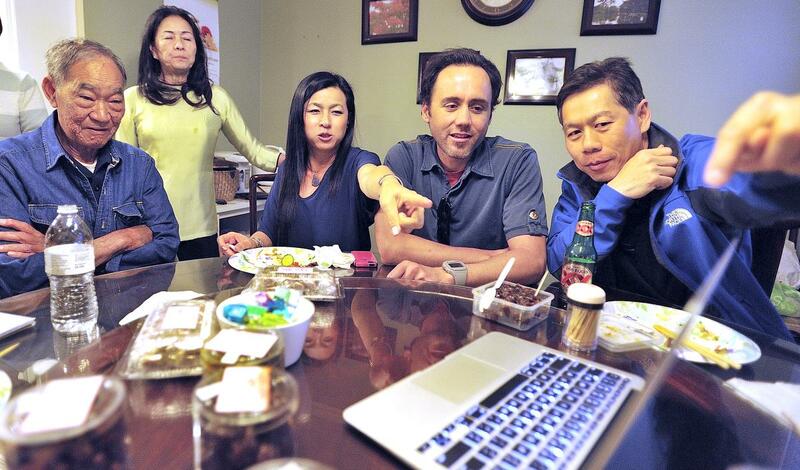 Hung Pham, left, his wife, Tam Pham, and their daughter, Lan Zentil, along with, Tammy Pham’s brother, Liem Lam, right, check out a video shot by Zentil’s husband, Tony Zentil, during a recent trip to Vietnam at a family get-together in Fountain Valley. 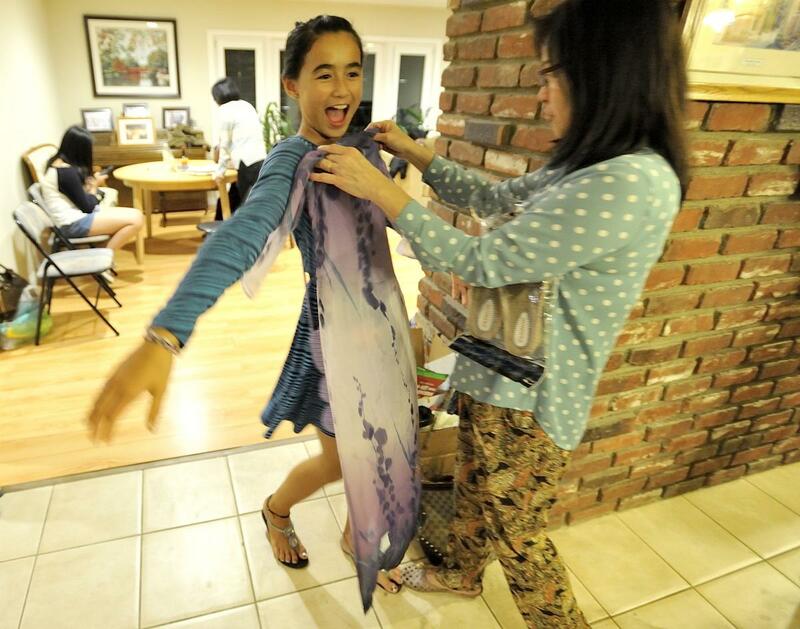 Tasha Zentil shows of a handmade dress she got in Vietnam to Thu Phan at a family get-together in Fountain Valley. Lan Zentil, 40, right (dark blue shirt), and her sister, Elyzabeth Luu, 42, right, (striped shirt) during a family get-together in Fountain Valley. 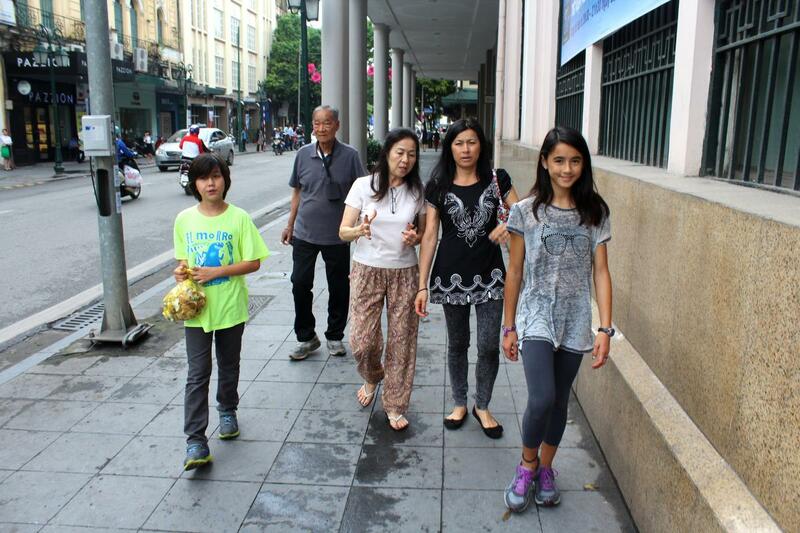 Hung Pham, back, and his wife, Tam Pham, center, holding the arm of her grandson, Hendrix Zentil, walk in Hanoi with their granddaughter, Tasha Zentil, left, and daughter Len Zentil on April 6, 2015. This is neighborhood in Hanoi where Hung Pham grew up. 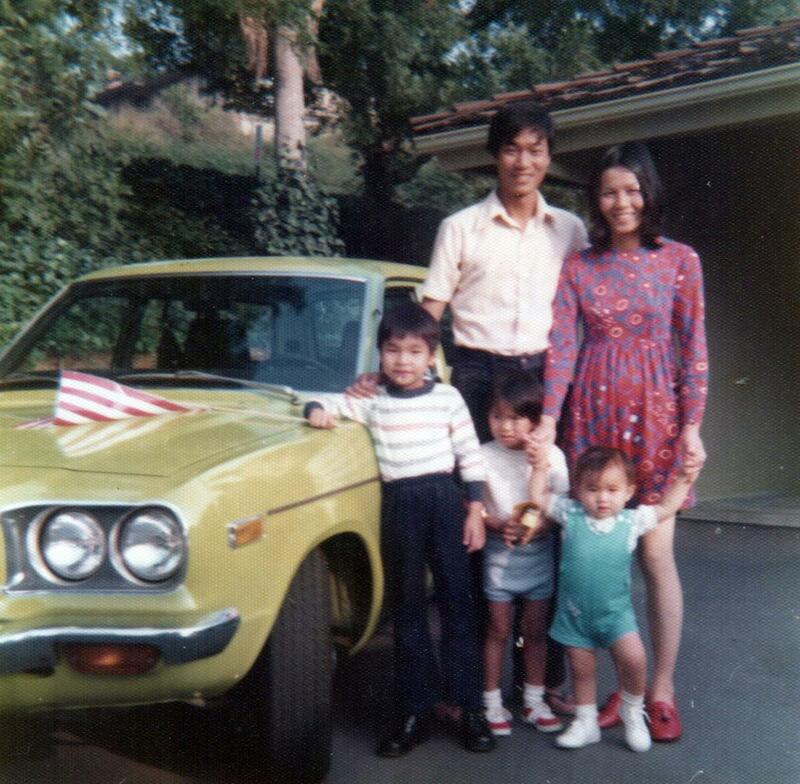 Tam Pham and Hung Pham, at their sponsor’s home in West Covina with their first car and their children, Gem Pham, left, Elyzabeth Luu, second from left, and Lan Zentil, 1975. 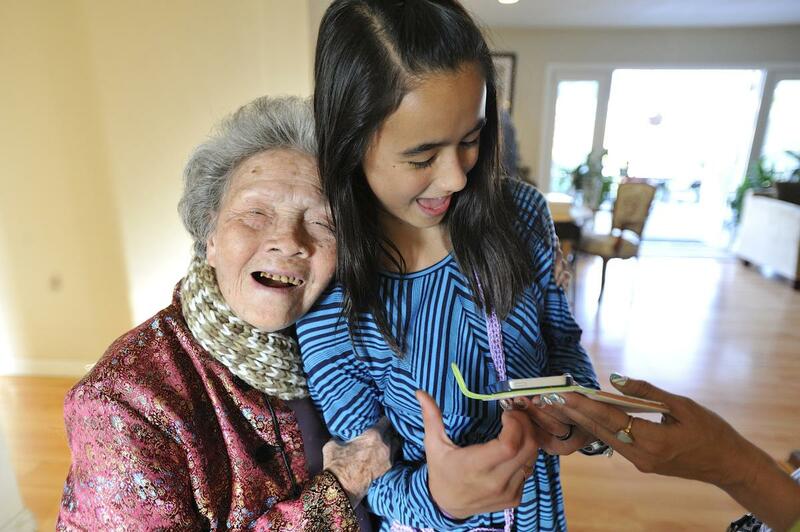 Chinh Le laughs with her granddaughter, Tash Zentil while looking a picture they took together during a family get-together in Fountain Valley. 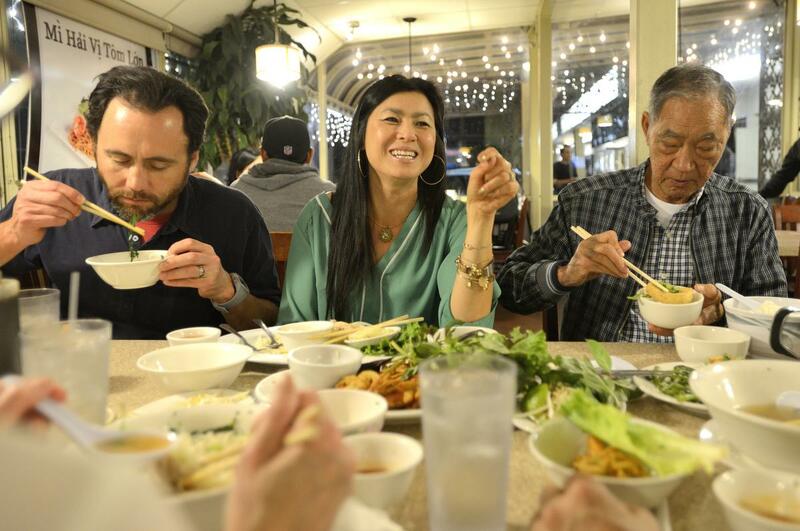 Lan Zentil, center, chats with family as she eats with her husband, Tony Zentil, left, and father, Hung Pham at Pho Quang Trung Restaurant in Little Saigon. The family was sharing a meal at one of their favorite restaurants before heading to Vietnam. Tam Pham and Hung Pham, right, with their children, Gem Pham, left, Elyzabeth Luu, second from left, and Lan Zentil, at Camp Pendalton in 1985. The picture was taken during a 10th anniversary of the fall of Saigon event. 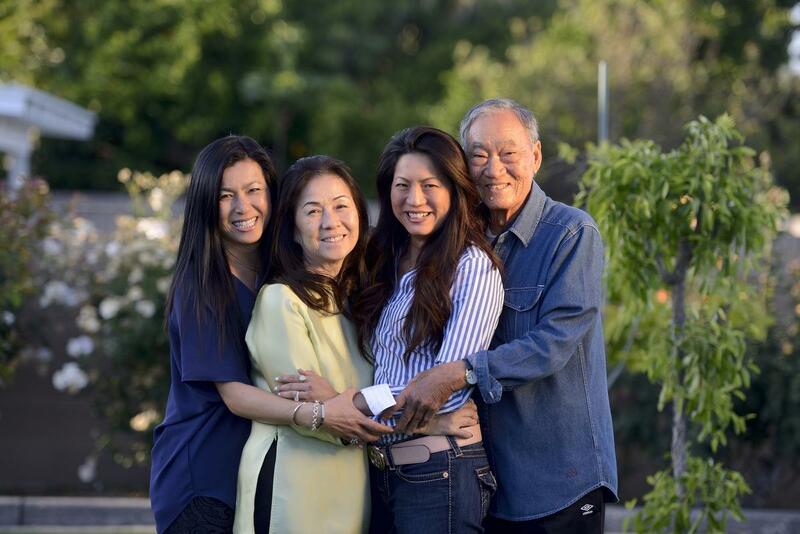 Tam Pham, 66, second from left, and Hung Pham, 77, right, with their daughters, Lan Zentil, 40, left, and Elyzabeth Luu, 42, during a family get-together in Fountain Valley. Their son, Gem Pham, 45, is not pictured. Lan Zentil, takes a selfie with her parents, Tam Pham, left, and Hung Pham, center, before seeing them off on their flight to Vietnam at Los Angeles International Airport. 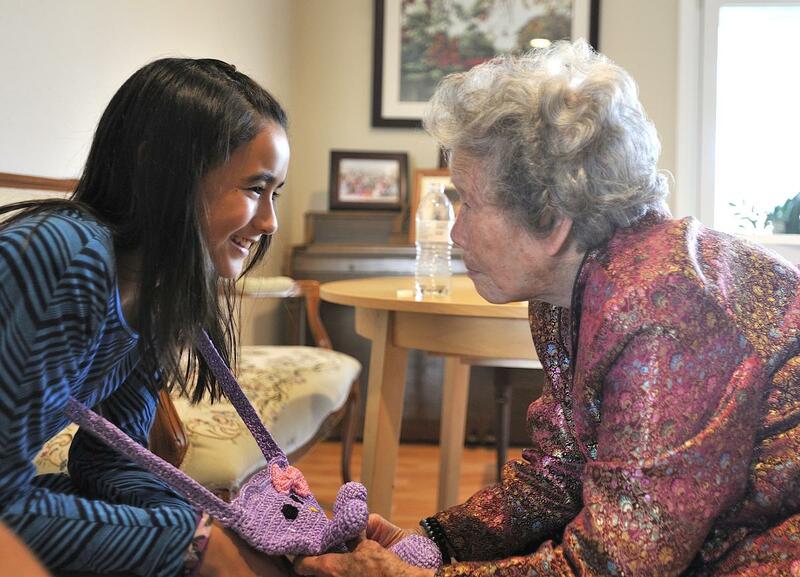 Tasha Zentil, left, shows her great-grandmother, Chinh Le, a handmade purse she bought during a recent trip to Vietnam during a family get-together in Fountain Valley. ________ came to the United States in 1990? ?